The steel cuting cutting ceremony of the first KSS-III (Jangbogo III programme) heavy diesel-electric submarine took place yesterday (November 27th) at DSME shipyard in presence of the Republik of Korea Navy (ROK Navy) Chief of Staff, Defense Acquisition Program Administration (DAPA) representatives and DSME officials. Batch-I consists in the first two hulls to be built by DSME. Batch-II will consist in three hulls built by HHI (Huyndai Heavy Industries). They will be fitted with a greater deal of South Korean technology. Batch-III will consists in the four remaining hulls (for a total of nine KSS-III submarines across all batches). The last submarine is expected to be delivered in 2029. The original design of the submarine includes 6x VLS (vertical launch system) tubes. They would accomodate a future cruise missile in development by LIG Nex1 while the launchers would be provided by Doosan. It was announced earlier this year that Spanish company INDRA was selected to provide its electronic defense system (ESM) PEGASO and Babcock of the UK would design and manufacture the Weapon Handling System for the Batch-I submarine. It was officialy announced during Euronaval 2014 that Sagem would supply the optronic masts for the class. Navy Recogition learned in september from a source that Thales would supply sonar systems for the class. However it appears that flank array sonars will actually be provided by Korean company LIG Nex1. 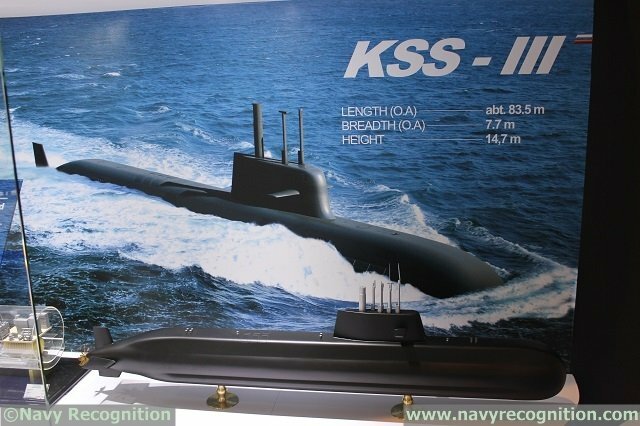 LIG will also supply KSS-III's combat management system. The submarine will be fitted with south korean lithium-ion battery technology.